One of the reasons Britain does not have a large racing bike manufacturer like Colnago or Cinelli is because British frame builders have always offered frames built individually for the rider. Unlike the Italians who built in batches to standard sizes. It’s hard to believe now but in the 1960s our Ellis Briggs frames with fancy cut out lugs, were falling out of favor with cyclists. We’d often get asked to leave the transfers off. Ellis Briggs as a brand was now “old fashioned”. Our shop manager at the time, John Rayner had a stroke of genius which solved the whole problem. Favori was born and one of the first frames we started to offer under the Favori brand was the Gran Premo. So in 1965 the first Gran Premo frames were launched and they became a popular alternative for cyclists who wanted an Italian style frame but didn’t want to lose the bespoke nature of a British built frame. Our new Favori Gran Premo is our Race, Sportive or Club bike. 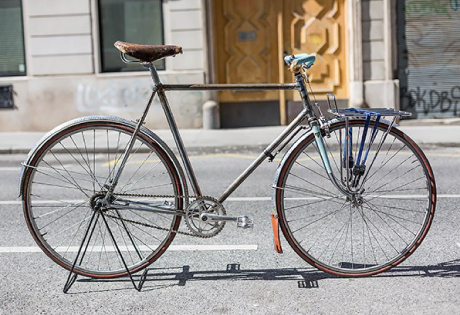 The Gran Premo can be customised for you with a choice of standard or bespoke geometry, plain or fancy lugs, Reynolds or Columbus tube sets, stainless steel dropouts, disc brakes and chainstays, mudguard and rack eyes if required. Frame weight down to 1650 grams in a 22 1/2 frame and 853 Pro Team Tubing and forks down to 650 grams. A complete bike can easily be built to weigh 8kg/18lbs but with all the advantages of steel, such as ride quality and comfort, bike fit, uniqueness and longevity. Prices starting from £1300 for a frame and forks and £2000 for a complete bike. Lead times for frames starting from 12 weeks.